Delicious refreshing sour damson fruits, with a lovely lively acidity and a strong mineral streak. Perfect served coolish with fatty pork dishes, or a medium-strength firm cheese. 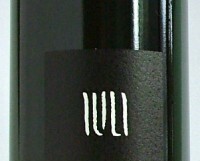 The back label simply says Vino Rosso. There is no vintage either. This small cantina, founded in 1998 by a small group of like-minded growers and winemakers led by Fabrizio Iuli, is dedicated to making high-quality Barbera in the Monferrato commune in Piemonte. They decided to leave the DOC, arguing they the authorities simply support large producers of average quality wine. These wines are excellent.